Wildly inventive young adult novel which uses strange, vintage photographs to drive a story with interesting characters and a truly eerie setting. Abe Portman is murdered by monsters only his 16-year-old grandson Jacob can see. Doubting his sanity, Jacob travels to Wales to learn the truth about Abe’s past. There he investigates an abandoned orphanage – a home for “peculiar” children – where Abe once lived. Jacob soon stumbles back in time only to meet Orphanage Director Miss Peregrine as well as a slew of strange children such as Emma, who can control fire, and Millard, who is invisible. Going back and forth in time, Jacob warns the orphans about mysterious deaths that are occurring. They fear the deaths are caused by the same monsters that killed his grandfather, monsters Jacob’s “peculiar” talent enables only him to see. 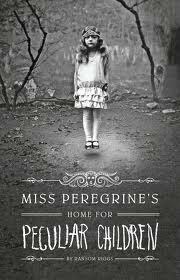 Jacob and the kids kill one monster only to find Miss Peregrine kidnapped and the orphanage destroyed by another. The crisis forces him to decide if he will stay in the past or return to the present and his family. I plan to read this sometime soon! 🙂 It sounds very interesting. I jump around a lot, too. Just finished Dessen’s Saint Anything. I liked it. Dessen really gets into the character’s heads, but I thought the plot was a little thin. Still, I like her very much.